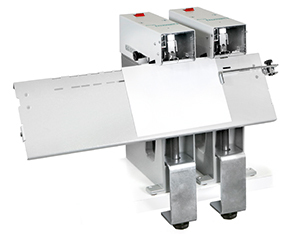 The proven electric stapler Rinak has been developed further and is now also available as Rinak Duo. By connection two Rinak staplers, booklets and pads can now be produced with two staples in one pass. Even single Rinak staplers which are already installed at customer places can be upgrated to a Rinak Duo. The staples are positioned precisely and the accurate spacing of the staples à which is especially important with loop staples à is ensured. Producing booklets up to 30 sheets and pads up to 40 sheets by using staple sizes 26/6, Ri26/6 and 26/8S. Use of loop staples as a standard feature without any extra adjustments. A switch allows to choose between thin and thick paper stock. Operated by a foot switch.